New AC Series coming June 18 !! Sim Racing System Sim Racing System News New AC Series coming June 18 !! It is known that some real drivers have been using and enjoying SRS. We are delighted to announce the Official Daniel Juncadella eSports Series at SRS!! The series will run on tuesdays, 20:30 GMT with the Seat Leon TCR (fixed setup). 10 min Qualify + 20 min Race for all races except Nords (20 min qualy + 1 hour race). 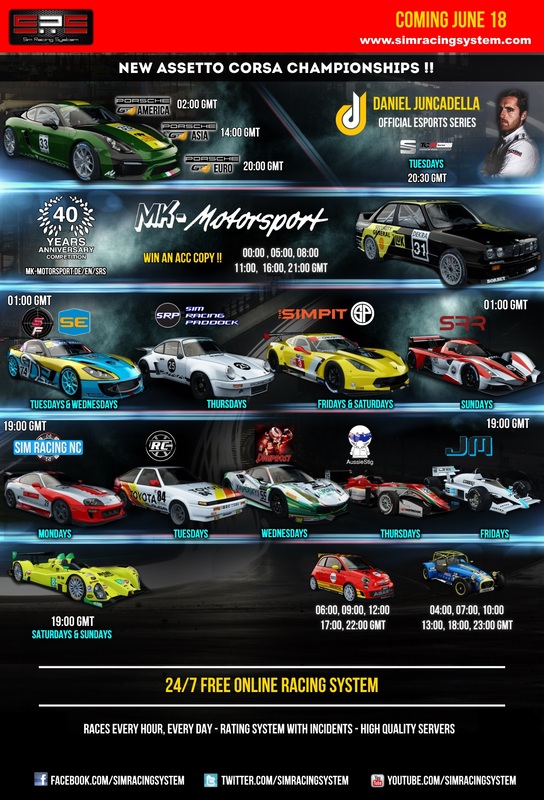 MK-Motorsport 40th Anniversary Special Competition. We will continue to celebrate MK-Motorsports 40th aniversary. Introduction to this company has been made on the previous series announcement but you can find all the info at their website MK-Motorsport. this time on AC, with the DTM90s. The series will use all DTM90s cars from Kunos. The official livery from MK-Motorsports BMW car is part of ACs base content. Celebrate with us and win an Assetto Corsa Competizione license!! Find out more at MK-Motorsport. It is nice to see how SRS grows every day, thank you. to make it clear: The "MK-Motorsport 40 Years Anniversary Competizione" will give away two copies of Assetto Corsa Competizione drawen by lot to two members of the top 200 participants. Also: historicaly the MK-Motorsport never faced the Alfa Romeos in DTM. Because they came when we left. But in prior of the fun we want to race against the Alfas. And please show the Alfas where they belong: in the mirror of your MK-Motorsport BMW M3 E30! Important note: Kunos Simulazioni has announced the release date of this title for Summer 2018. The two winners of this competition will receive a coupon for each Assetto Corsa Competizione® Steam® Early Access Version. When Assetto Corsa Competizione® is available in the country of the winner and in Germany, the voucher can be redeemed via socialmedia@mk-motorsport.de. For this purpose the Steam® Account Login Name is required. The game can only be unlocked and played through Steam®. I'm really liking the choices, I feel like the daily series are going to be a blast to race in! Thank you, very excited about the series, great choices!